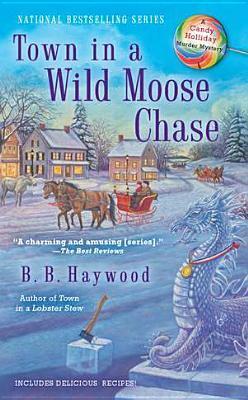 Town in a Wild Moose Chase by B.B. Haywood is the 3rd book of the Candy Holliday mystery series set in contemporary Maine. As seaside Cape Willington holds its annual Moose Fest, complete with ice-carving competition, parade and fancy-dress Moose Ball, newspaper reporter Candy Holliday once again gets involved in a murder investigation. Candy solves the mysteries, as usual barely escaping with her life. However, the heavy foreshadowing of future crimes in a scene with a boring villain (from the previous mystery) saps my interest in the series (besides, the main and supporting characters don't have interesting personalities). Sign into Goodreads to see if any of your friends have read Town in a Wild Moose Chase.